Wear a Fairy Godmother costume to a party and you are sure to get many job offers from young ladies wishing to have their lives sorted out by a benevolent, magical force. When you think of a fairy godmother, the image of Cinderella’s kindly protector come to mind – you know, the one that changed a pumpkin and mice into a horse-drawn carriage! There were also fairy godparents in Sleeping Beauty, both good and evil. In the cartoon “Fairly Odd Parents” on Nickelodeon, Cosmo and Wanda are the fairy godparents that are always botching the job! The traditional fairy godmother costume, such as the one in Cinderella, features a long gown covered with a hooded cape. Most traditional fairy godmothers are described as magical surrogate grandmothers, so a grey wig would be appropriate to add on some years. 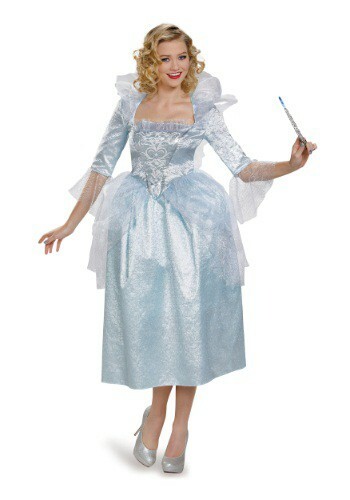 For those of your with a bad-girl bent, mess up someone’s day dressed up in a wicked fairy godmother. A black gown and full cloak will set the stage for your evil intentions – don’t forget your magic wand.